Black Friday is coming around the corner FAST! Have you thought about getting deals on awesome skin care products? Well I'm going to hook you up! One of my close friends (also named Catherine!) 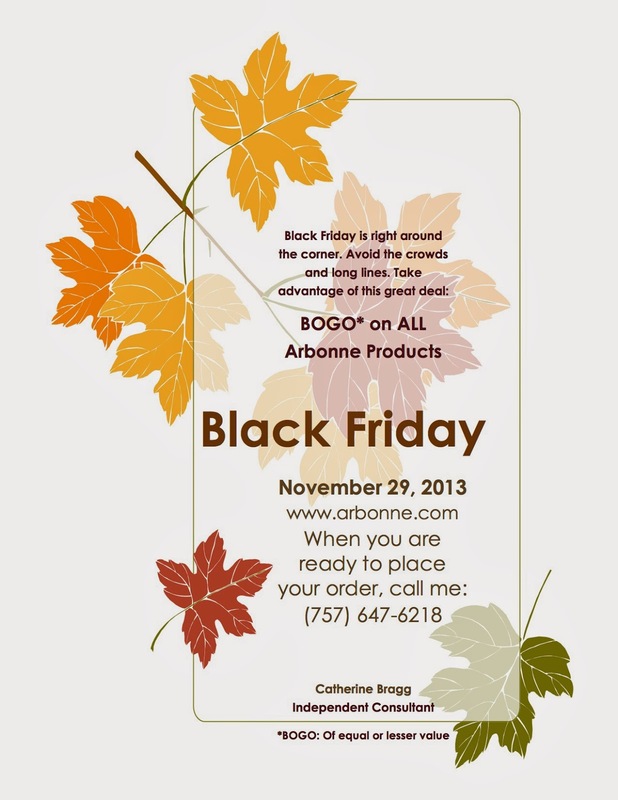 is having a Black Friday sale with Arbonne! BOGO on ALL Arbonne products!! That is an amazing deal! Arbonne is an amazing skin care company that's mantra is "Pure, safe, and beneficial." All of their products fit those 3 simple words. They provide products that are vegan, gluten-free, plant and botanically based and filled with beneficial vitamins. If any of their products ever have any sort of reaction during testing, they will pull the product and perfect it before trying again. They are safe for the most sensitive of skin! I personally have enjoyed Arbonne products off and on since I was a teenager and they've always worked well for me. I've also never met someone who has tried Arbonne and not been totally satisfied! Favorite #1: Night Repair Creme - This stuff is awesome. You put it on before bed and your face feels as soft as a baby's bottom by morning! It keeps your face moisturized but NOT oily! Favorite #2: Makeup Primer - I'm not big on make up but this primer is super soft and smooth. It doesn't even feel like anything is there! Bonus points: Arbonne's primer is ranked #1 by Allure magazine for being long lasting! Favorite #3: Chocolate Protein Shake Mix: Know how most protein shakes taste nasty? Well, this one doesn't! I'm picky when it comes to protein shakes but this one is smooth and yummy. On top of tasting good, it also has 20 grams of vegan protein and 20 essential vitamins and minerals per serving! Win-win! Now, we're just about ready to consume our weight in turkey, ham, stuffing, mac and cheese and tons of other amazing, delicious foods, so don't forget to check out their line of Essentials for health! But don't wait...call Catherine (757) 647-6218 to order now and get BOGO on all these amazing products! What's your favorite Arbonne product? I love the citrus foot scrub! Disclaimer: I may be compensated for this post but all opinions are 100% my own. I'm always totally honest with you guys.